M. Aurelius Claudius, was descended from an obscure family, and by his military talents rose to distinction under Gallienus and Valerian. He succeeded to the empire on the death of Gallienus (268). Next year he gained a great vistory over an immense host of Goths in Dardania, and received, in consequence, the surname Gothicus. He died at Sirmium in 270, and was succeeded by Aurelian. Obverse: IMP C CLAVDIVS AVG, Radiate, draped, and cuirassed bust right. 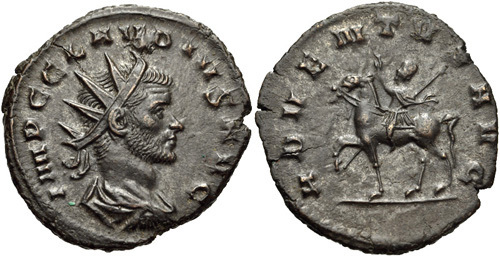 Reverse: ADVENTVS AVG, Claudius on horseback left, raising right hand and holding scepter in left. Obverse: IMP CLAVDIVS AVG, Radiate cuirassed bust right. Reverse: AEQVITAS AVG, Aequitas standing holding balance and cornucopiae. Obverse: IMP C CLAVDIVS AVG, Radiate, draped bust right. Reverse: ANNONA AVG, Annona standing left, foot on prow, holding grain ears and cornucopiae. Obverse: IMP CLAVDIVS AVG, Radiate bust right. Reverse: FIDES MILITVM, Fides standing facing, head left, holding scepter in left hand and signa in right hand; -/E. Obverse: IMP C CLAVDIVS AVG, Radiate, cuirassed bust right. Reverse: GENIVS AVG, Genius standing left by altar, holding patera and cornucopiae. Reverse: GENIVS EXERCI, Genius standing facing, head left, holding patera in right hand, cradling cornucopia in left arm. Obverse: IMP C CLAVDIVS AVG, Radiate, cuirassed and draped bust right. 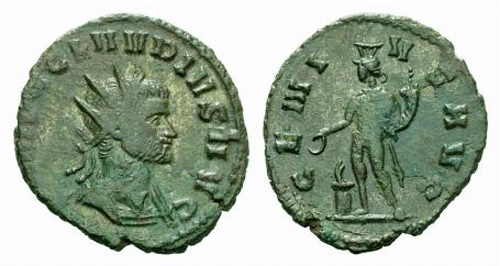 Reverse: IOVI STATORI, Jupiter standing right, holding thunderbolt and sceptre.